Photo: Lila Flavin. Left to right, that’s me, Kerri Hawkins, and Dr. Wayne Altman. Tomorrow night, I’m going to be smiling ear-to-ear along with my nonprofit partners and the principals of a major foundation. 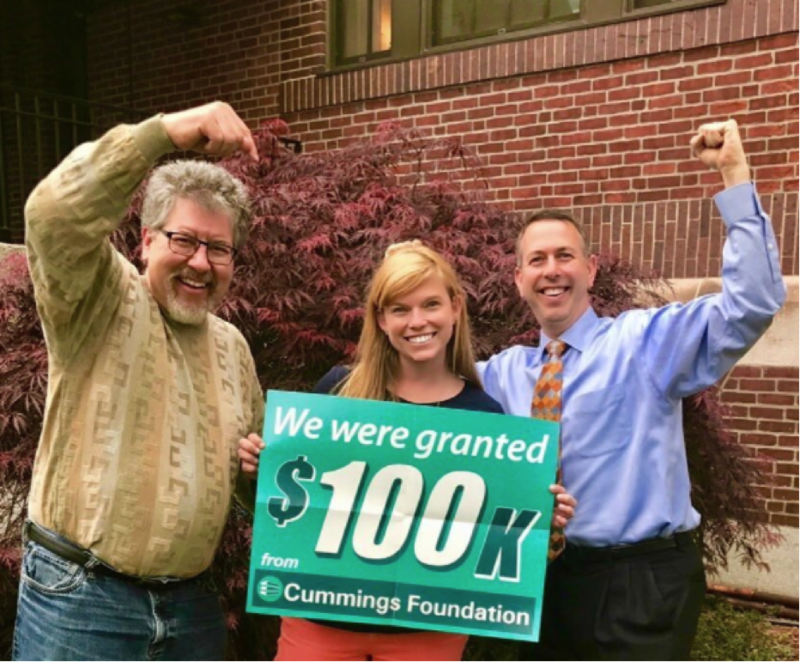 We’ll be celebrating getting a $100,000 grant from The Cummings Foundation of Greater Boston. I’d like to explain how we got here, because if you’re seeking grants, our story might help you . . . and even if you’re not, I thought you might enjoy an uplifting story. This story starts about five years ago, when I was much fatter. My wife suggested I contact Dr. Wayne Altman, a family physician in my home town of Arlington, Mass., and Kerri Hawkins, a dietitian that works with him. I was skeptical because I’m not much a joiner, and my weight problem seemed pretty much permanent. But these were serious folks: Dr. Altman is Professor and Vice-Chair of Family Medicine at Tufts University School of Medicine, and Kerri Hawkins is a past president of the Massachusetts Dietetic Association. Success depended on your goals. If you were five-foot six and weighed 280 pounds, and you ended up at 260, you were still overweight — but this was a success, because you were healthier in a permanent way. This was about improving health for adults in their thirties, forties, fifties, and sixties, not getting a beach body. The emphasis was on changing habits. This enabled you to make a permanent change. Diets fail because they are diets — by definition, a temporary solution that falls apart once you re-enter actual life. This program was holistic. We all live in a world with relationships and networks. What we eat is as much social as it is intentional. We have families, who may support us or undermine us. What’s in the pantry or on special at the cafeteria has a lot to do with what you end up eating. So their program focused on how to actually live a healthier life with all this other stuff going on. We supported each other electronically. We used a simple email list that we were all on to ask for help, show what we were doing, and make promises to each other. At one point, I arrived in Amsterdam after a long and grueling trip to find my hosts has nicely left me a huge mug of chocolate eggs in my hotel room. I emailed a photo to the group and said “I am not eating these.” And then, having made a promise, I had to not eat them. Anyway, exiting the program 30 pounds lighter, I told the principals “You should write a book; I’ll help you get started.” To make a long story short, they didn’t. But we figured out we could work together. And eventually, we formed a nonprofit organization, WellnessCampaign.org. Since Dr. Altman was the doctor and Kerri Hawkins was the dietitian, they had to find a role for me. So they made me the (unpaid, volunteer) CEO, even though I’ve never been CEO of anything before. I took the job partly to give back to people who had helped me, and partly because I knew it would keep me honest to remain in contact with these talented, health-focused people. Wellness Campaign moved forward slowly. We created some materials and videos. Dr. Altman and Ms. Hawkins kept running groups in Arlington. They recruited physician/dietitian teams from the Massachusetts towns of Woburn, Bourne, Framingham, and Lee to run their own groups. Eventually we had enough data to write a paper, which will soon be published in a nutritional journal. I crunched the data for the team and found out that the average participant lost 17 pounds (which is typical of weight loss programs). But the thing that stood out was that after a full year, among the participants who had lost significant weight, 69% kept most of it off. And among the smaller group of patients who’d were three years out of the program, 71% of those who had lost significant weight had kept most of it off. So our program was typical for weight loss during the program, but unusual in the sustainability of that weight loss — a reflection of the emphasis on changing habits. Most other programs can’t show these long-term results, because they simply don’t track people once they leave the program. This was great. But while our goal was to replicate this success on a larger scale, we were not successful at fundraising. We applied for a grant and got turned down. I raised a few thousand dollars with a bike ride to Cape Cod. But to accomplish our dream, we needed more, and none of us had any experience raising money. We would target the community of Woburn, where Dr. Altman lives. (Cummings focuses on a specific set of communities including Woburn.) Because Cummings focuses in part on improving people’s health, we thought we had a shot. We would focus on a specific group of participants: employees of the city of Woburn, like teachers and police. We would pioneer a new model — teaching non-medical leaders, who would then run groups of their own. To enable those leaders to succeed, we would create new materials and update the email lists into a full-fledged online community. Through his local connections, Dr. Altman was able to get letters of recommendation from the mayor of Woburn and the superintendent of schools. Our goal is to empower as many people as possible to make sustainable and positive changes in their health. Wellness Campaign achieves this goal by providing individuals, groups, and communities with a multitude of effective tools and resources—online, mobile, video, print, community, and in-person—to promote adoption of common-sense healthy habits. We guide participants to adopt one healthy habit at a time, as they lose weight and improve their quality of life. Our focus is on behavioral change that yields long-term weight loss and health improvements. Our techniques are rooted in established medical research, not fads or diets, because traditional diets don’t create permanent change and, often, do more harm than good. The ambitious goal of Wellness Campaign is to change the culture of both communities and individuals. For an individual, changing one’s culture means grappling with the traditions and habits that we grew up with and understanding how they support or undermine the positive changes that we want to make. We help people to embrace a new culture – a new way of living – that is uniquely their own, but leads to sustainable healthier habits and lifestyle by changing what they eat, how they eat it, how they move, how they sleep, and how they get access to support from friends and family. . . . Participants frequently comment that knowledge is not their problem—they know what to do. They just need the motivation to do it. The Wellness Campaign model generates the high levels of support and accountability needed to fuel this motivation. This has led to a dramatic level of sustainable success compared to other wellness and weight loss programs. The average participant in the Wellness Campaign program has lost close to 20 pounds. Of those who lose significant weight, more than two-thirds keep most of the weight off in the years that follow. While many programs are successful at generating short-term weight loss, Wellness Campaign is one of the few that can prove success, not just with losing weight, but with maintaining weight loss. We have submitted our results for publication in a respected medical journal (manuscript attached in the budget section). . . .
Wellness Campaign requests $50,000 per year for the next two years to develop a sustainable volunteer-led program for Woburn employees. In the first year, we will recruit and train 20-30 volunteer Woburn Wellness Champions, including city employees from the Woburn Public Schools, police, fire, and city hall. Volunteers who complete the 20-week Wellness Campaign Program will then be trained to lead wellness groups on their own. . . .
Because this model shifts a community through trained non-medical wellness champions, it significantly expands our current medically-led model. While countless efforts to curb the obesity epidemic have been undertaken all over the US, overweight and obesity levels continue to rise. Nothing short of a cultural shift within a community will make a dent in this epidemic. At Wellness Campaign, our Group Learning and Accountability Model has proven to be successful at this. If we are successful in Woburn, this program could be replicable in other communities across the country and become a national model for establishing sustainable wellness, one community at a time. Looking back at this, there is a little more passive voice than I’d like, but we’ve kept the superlatives and jargon to a minimum. We had a clear story to tell, and we told it. People who grant money are not impressed with cheerleading. They want past results and a clear plan for the future. That’s what we gave them. I’d like to tell you that the path to the grant was smooth, but it wasn’t. We got a call one day late in their evaluation process asking us to switch from a two-year plan to a three-year plan with $33,000 per year, and to update the proposal in one business day. Dr. Altman was traveling and unavailable, so I had to make the budget changes and change the description quickly. But I think the Cummings Foundation recognized the worth of our proposal and appreciated our responsiveness. So a few weeks later, we got a very nice letter telling us we had received the grant. I can’t help but look back on my career and see how it put me in a perfect position to succeed here. My statistics and survey background put me in the best position to do the math for the paper. My business experience made it possible for me to create plan and budget documents based on Dr. Altman and Kerri Hawkins’ vision of what they wanted to do. My social media background enabled me to see what might actually be possible with an online community for the program participants. My clear writing skills made the grant proposal more persuasive. It feels great to be a part of this. Now all we have to do is what we promised. That will be a big job in the next three years, but we’re ready to scale up. I’m psyched. This is amazing, Josh! Congratulations! Congratulations, Josh. All the best with your future work in this area. I’ve seen a fair number of grant proposals in my time… I can only imagine how happily surprised the people at Cummings must have been to see a jargon-free proposal. THAT is a rare and lovely thing, in Nonprofitland. Congrats on your win … go forth and do great things! Josh: Congratulations, well done. Having written many grants, I know how difficult it is to actually get one. This is well written and is also is trying to solve an important problem for our society. Best wishes for a successful outcome. The joy and “naches” from this positive achievement will burn your next 5kg. Huge congrats. As the Chair for a small community-based, aged care NFP in Australia, I will be sharing this article with my fellow Board members as a source of both focus and inspiration. I’m sure that over the next three years there are communities from Hudson to Holyoke from which to “amass bigger data”. Yes, I did that. Keep us informed of progress. Way to go! I hope you all can scale this program beyond Boston to Atlanta. Godspeed to you all.